Library image #569: View from Three Gun Spring trail. The United States Congress designated the Sandia Mountain Wilderness (map) in 1978 and it now has a total of 37,278 acres. All of this wilderness is located in New Mexico and is managed by the Forest Service. Despite the fact that these mountains tower above the very nearby sprawl of Albuquerque and despite the fact that the trails of this Wilderness may be more heavily used than any other trail system in the state, Sandia Mountain Wilderness still provides an opportunity to get out of town . . . but be prepared to work for your solitude. The area lies primarily on the western slope of the Sandia Mountains, but it crosses over to the eastern side at the north and south ends. Spruce and fir dominate the high country, with stands of mixed conifers just below. Many raptors migrate through these mountains in spring and fall, sharing their territory with a few mule deer and black bears. Accessible from the tram is the Crest Trail, which runs along 26.54 miles of the main ridge of the Sandias at an elevation averaging 10,000 feet. There are 117 miles of well-maintained trails here, but you have the best chance of avoiding other hikers if you stick to side trails. Carry water, as there is very little in this region. 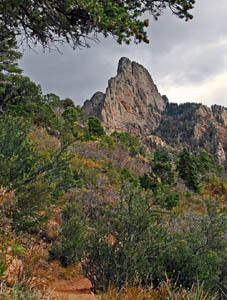 Planning to Visit the Sandia Mountain Wilderness? How to follow the seven standard Leave No Trace principles differs in different parts of the country (desert vs. Rocky Mountains). Click on any of the principles listed below to learn more about how they apply in the Sandia Mountain Wilderness.